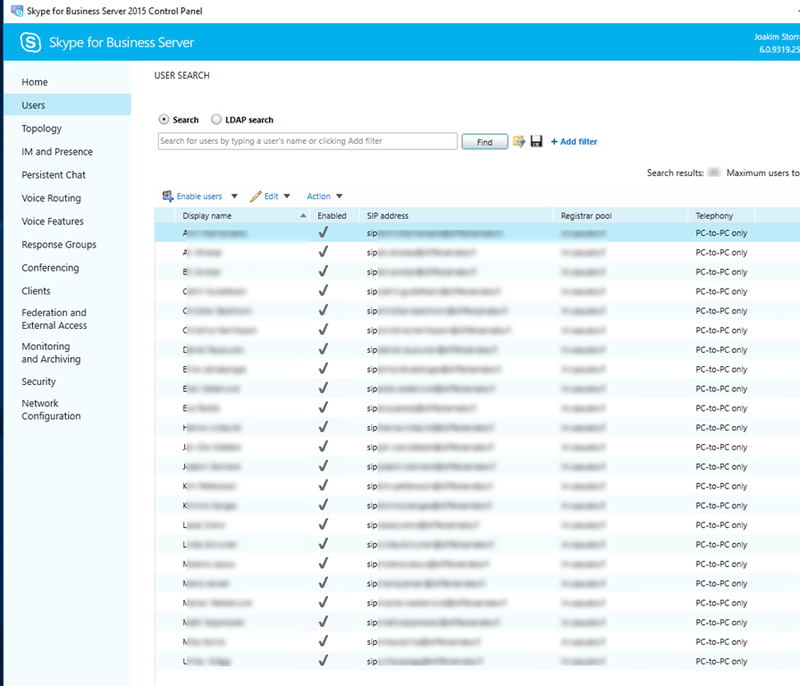 I was given the task of deploying a full-blown on-premise deployment of Skype for Business Server 2015 for a small company. The deployment also included an Edge Server and a Reverse Proxy server (IIS with ARR). In this blog post I’ll discuss the deployment process in general, and also the problems (and solutions) that were discovered during/after the deployment. I’ll end the post with some check-up/misc. information. The next chapter will present the actual front-end installation, including some dilemmas/gotchas. After that I’ll continue with the Edge and Reverse Proxy installation. 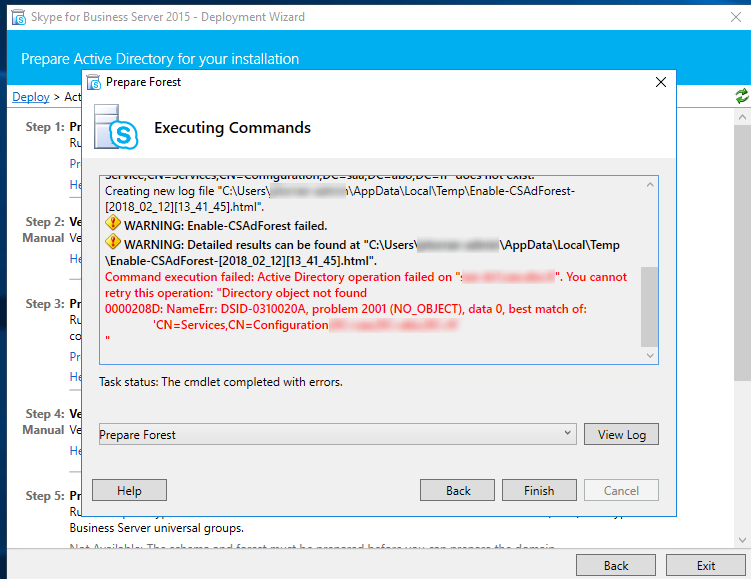 For the front-end installation I followed TechNet’s deployment article with some twists. As usual, it didn’t quite work as planned 🙂 I’ll now try to explain the process in detail, including some problems along the way. Before starting the actual setup, I double checked that my network and AD infrastructure was setup correctly. I also checked that I had a working ADCS (not setup by me), so I could get internal certificates assigned on the front-end. (This actually turned into quite a mess, see the next chapter about front-end certificate gotchas). Finally I checked that I had created/requested all the DNS aliases needed in the internal DNS zone. Installed pre-requisites for Windows Server 2016, which are slightly different compared to Windows server 2012 R2. 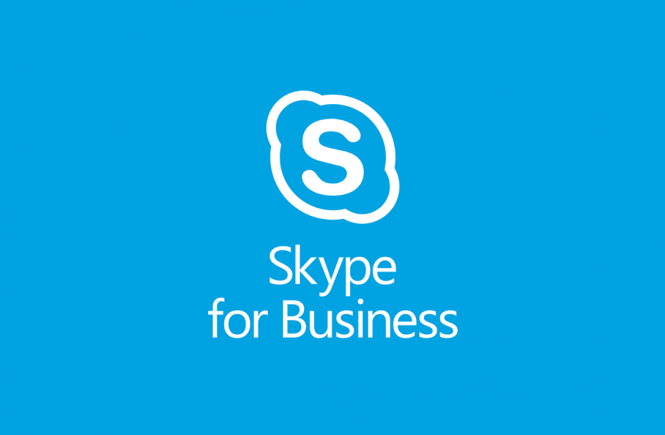 Information can be found at: https://blogs.perficient.com/microsoft/2017/08/skype-for-business-how-to-install-on-windows-server-2016/ for example. (The issue regarding IIS URL Rewrite module wasn’t a problem in my deployment, btw). Created the file share (local). “The file share cannot be located on the Enterprise Edition Front End Server, but can be located on a Standard Edition server. You can define the file share in Topology Builder before you create the file share, but you must create the file share in the defined location you define before you publish the topology”. 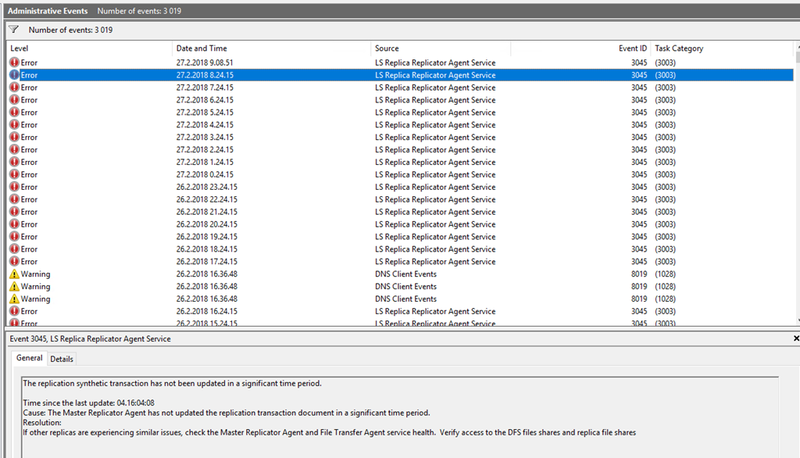 Prepared Active Directory, using an AD account with enterprise/schema admin rights. Success! The -GlobalCatalog option was the key. Web services external url is specified as webext.domain.com (in the DNS front-end information earlier). Simple urls are also specified according to the DNS information. But wait. Read carefully: “If this is Standard Edition, you will need to run thePrepare First Standard Edition Server process from the Deployment Wizardbefore you publish a topology. This prepares for Standard Edition by installing a SQL Server Express Edition instance and creating the Central Management Store”. I got no source for the above (too much googling), and afaik everything even looked OK in the screenshot. Make a note of the following: “Before you follow these steps, make sure you’re logged onto the server with a domain user account that’s both a local administrator and a member of the RTCUniversalServerAdmins group”. Ran Step 1, Install Local Configuration Store. No problems. 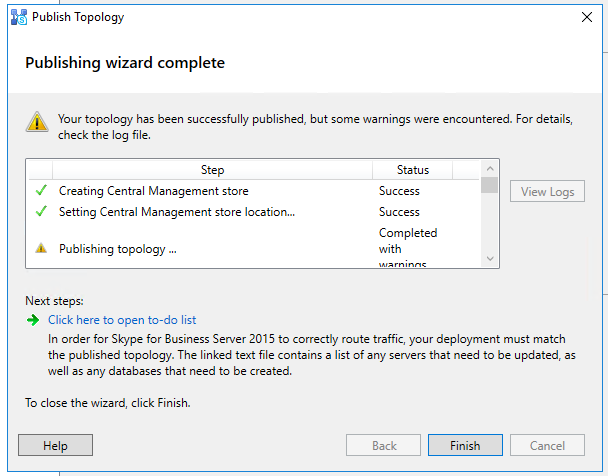 Ran Step 2, Setup or Remove Skype for Business Server Components. No problems. Ran Step 3, Request, Install or Assign Certificates. I checked with the “AD CS guy” that everything was in order for the request. It was. I made a custom request with the private key marked as exportable. I assigned the certificate (both for default and OAuth). It was now time to start all the SfB services. 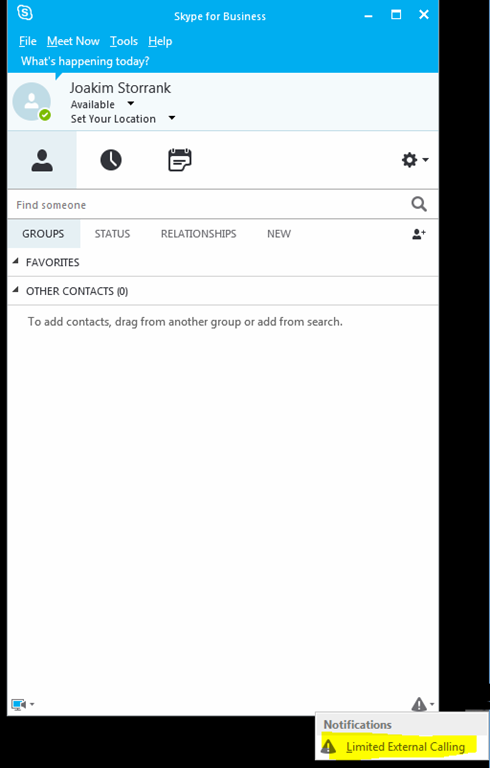 I finally configured integration between Exchange and Skype for Business (using OAuth). I wrote how to do this in my previous blog post, so have a look there for details. I also enabled MAPI for the company’s Exchange server for a smoother integration between SfB and Exchange. I’ve also written about this procedure in a previous blog post. As a last step, I wanted to bulk-enable a bunch of users from an AD group. Finally tested a SfB client, everything seemed OK! using internal certificates gave a certificate warning in ALL browsers except Internet Explorer / Microsoft Edge. I don’t know of ANY workaround for this, as I can’t make the internal CA root certificates available for Firefox or Chrome. 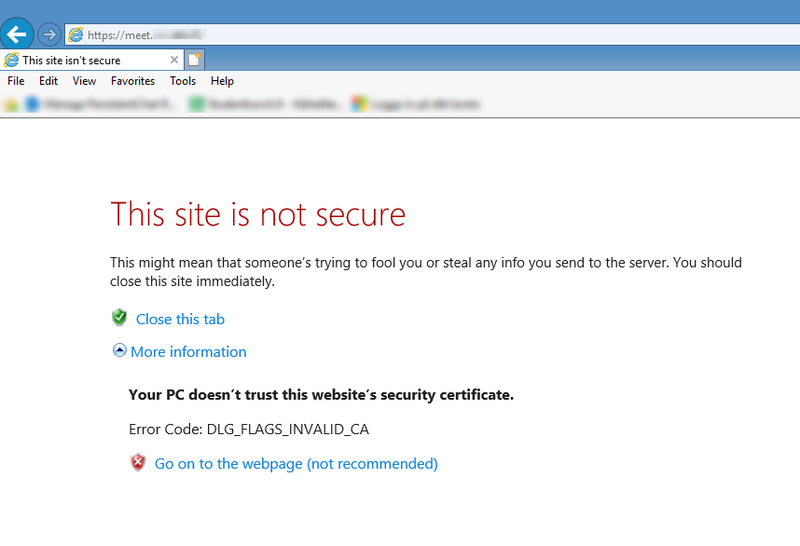 Short version story: a meeting link (https://meet.domain.com/whatever/XXXX) give certificate error no matter what I do on non-MS browsers. It does not matter if the connection is made internally or via the reverse proxy. 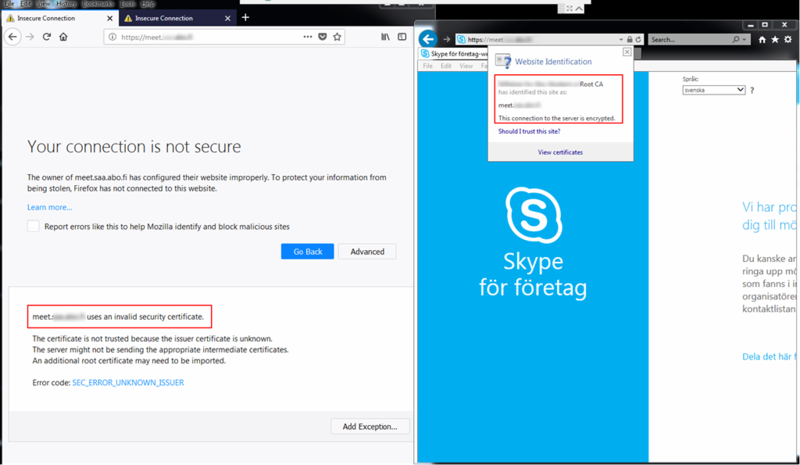 The SfB / Lync CLIENT is probably happy with the internal certificates (also through IIS ARR with SSL offloading), HOWEVER I don’t see this as a 100% working solution when an external participant could be using the web client for instance (and receiving a certificate error). I’ve written more about the certificate dilemma in a later chapter also, see “Problems after the deployment / Certificate problem revisited”. These are just example values. Subnet 1.2.3.0 and subnet 1.2.5.0 should use the internal NIC/interface and the gateway configured on that NIC (1.2.4.40 in the above example). (You should also edit the hosts-file on the Reverse proxy, NOT on the edge). You can read about DNS and certificate requirements in my previous blog post. Please do. Check the primary DNS suffix. It should match the suffix from the front-end. This is actually quite an important step so don’t forget to check it! Manually install the internal and external certificates via MMC. Your own method may be different. Also export (from the front-end) and import the internal CA root certificates. This is needed because the edge server is not domain joined. Google if you don’t know how, or read my previous blog post. 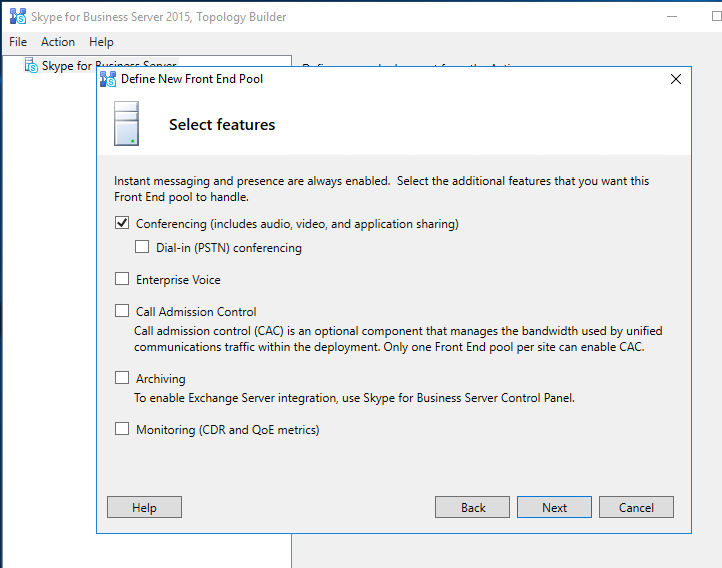 DO make sure that you create the new Edge Pool under the “Skype for Business Server 2015” branch, not under Lync Server 2013. Using IPv4 and no NAT. Certificates were already installed via MMC so no need to import, just assign. Created DNS SRV records (Step 8). The first one is needed, so don’t try without it. It won’t work. Be sure to enable needed rights for the anonymous users. Happy days, now moving over to the reverse proxy server installation. I’ll just do a mini-recap as this installation is almost identical to the existing one in my blog post Adding Edge and Reverse Proxy Servers to an Existing Lync 2013 Environment. 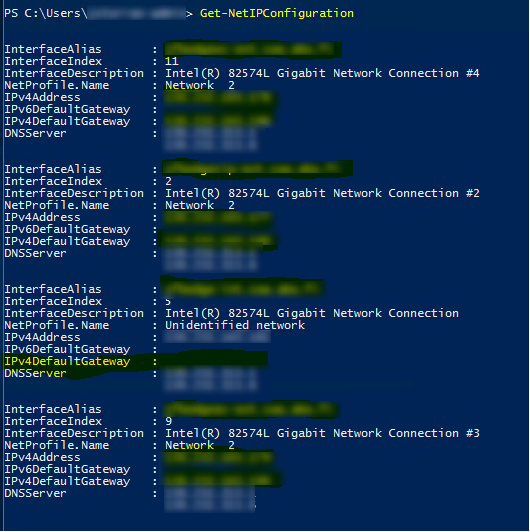 Checked the network interfaces (renamed and specified correct IP’s). Defined some hosts in the host-file. Check my above blog post. Installed the certificates via MMC. More detailed information in my previous post. 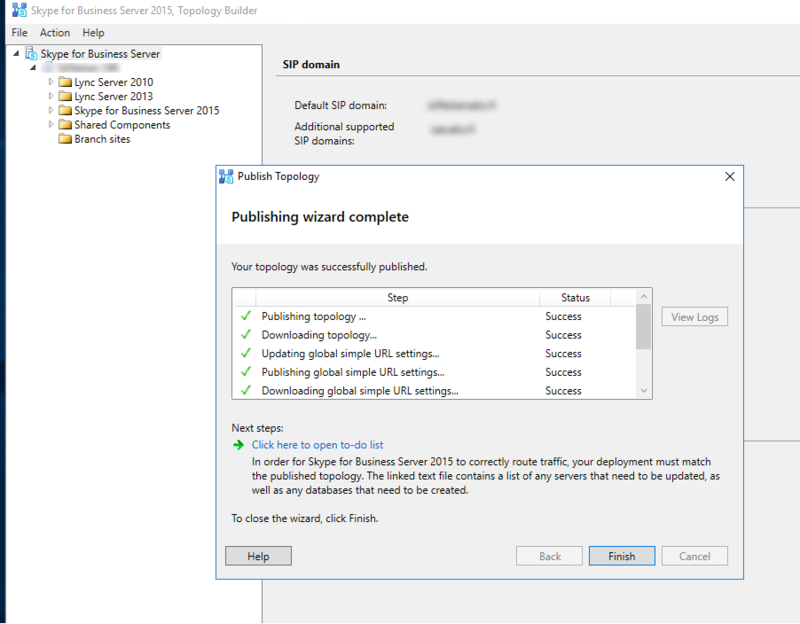 I previously followed http://jackstromberg.com/2014/11/tutorial-deploying-a-reverse-proxy-for-lync-server-2013/ for the IIS ARR rewrite rules. For some reason they didn’t work this time. Well, I’m not surprised, as IIS ARR is VERY picky about the rules. (It can actually be quite a headache to configure these). I love the fact that you get away with using just ONE server farm/rule for all the simple urls. (We’re not using Office Web Apps). It didn’t take me long to realize that this was a firewall problem. I thought I had notified the firewall guy about all needed (open) ports, but this one seemed to have slipped. Well, no problem. We opened up the replication port (4443) in the internal firewall, and the replication started working again almost instantly. As seen in the screenshots, port 4443 is listening as it should be. This clearly shows that the service is listening, and it shouldn’t be the cause for the problem. To the left we have Firefox. As you can see, the connection is NOT trusted even though I’m testing from a domain joined client. To the right we have Internet Explorer. The connection IS trusted (root CA is trusted). “Since Lync simple URL publishing does not require any SSL Offloading if you have the External Web Site in Lync assigned with a Public Certificate, you do not need a certificate installed on the IIS. Most likely you have assigned a private certificate from your internal Certificate Authority, and you have to assign the IIS ARR an public certificate and reencrypt the traffic for internal use. Well, I could probably have gotten rid of the Internet Explorer error on the external client (while still using internal certificates) by using SSL offloading on the reverse proxy. It doesn’t solve the problem with other browsers however, afaik. If you have a nice solution to this whole certificate-dilemma, please comment! All in all I think using a public certificate on the Front-end is easier, even though you’re “going against” best practices to some extent. At least it makes your life a whole lot easier. MRAS list the connection to the edge server, and it looks OK.
GAL search tells SfB to look for the address book from the Global Address List (Exchange) instead from the internal SfB server Address Book. EWS Internal URL is the connection towards Exchange. Contact List Provider UCS (Unified Contact Store) shows that the Address Book is situated on Exchange – we’re not using a local SfB server Address Book. UCS (see above) Connectivity State says that the connection to Exchange is active as it should be. MAPI Information states that MAPI status is OK (which it should be now that I’ve configured Exchange for MAPI). EWS (Exchange Web Services) is also OK. There are some “false positives” here. Only thing worth mentioning is the missing SRV record at the end. The test was also done with dual SIP domains, which is not the setup anymore. I’ve not added DNS records for federation either, as we’re not federating with any partners (yet). Lastly, I’m NOT using lyncdiscover.domain.com in the internal DNS (intentionally). 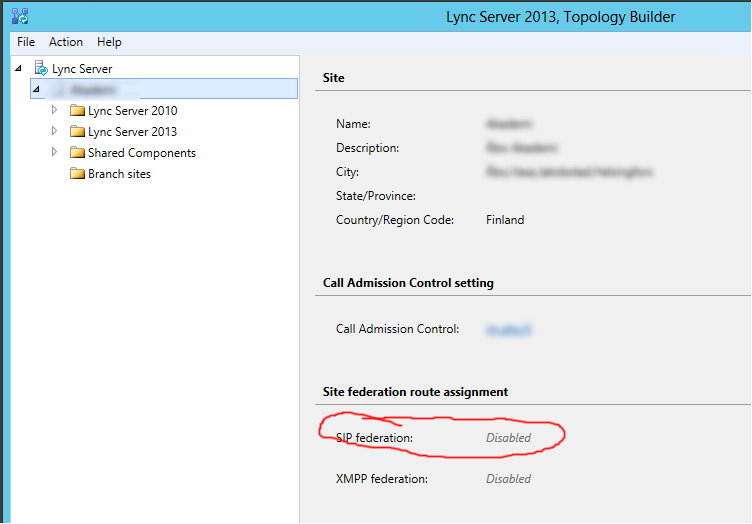 I have an explanation for this in my previous blog post Adding Edge and Reverse Proxy Servers to an Existing Lync 2013 Environment. For some quick information on how to use snooper, have a look at http://lynclead.com/?p=148for example. The log files for the newest SfB client are located in C:\Users\xxxxx\AppData\Local\Microsoft\Office\16.0\Lync\Tracing btw. SSL hardening of the SfB servers were done with IIS Crypto, https://www.nartac.com/Products/IISCrypto. I used the “best practices” template and received an “A” grade on Qualys SSL Labs Server Test, https://www.ssllabs.com/ssltest/. If you’re interested in getting an A+, have a look at https://scotthelme.co.uk/getting-an-a-on-the-qualys-ssl-test-windows-edition/ for example. This quite much summarizes the whole Skype for Business deployment. Be sure to check my other blog post about Edge and reverse proxy deployment also, as it includes some deeper information not mentioned here. My recent task was to expand our existing Lync environment (Lync Server 2013 Standard) with an Edge and a Reverse proxy server. 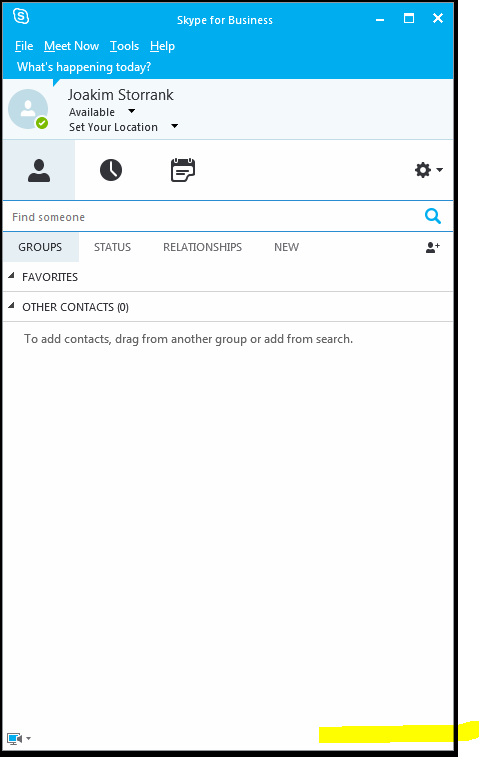 (This guide probably works for Skype for Business as well). Our old Lync environment had been in test usage for a while (with a rather small test-user group), but with more and more Lync users adding up it was time to expand. As a matter of fact, a Lync environment without Edge and reverse proxy servers is rather useless – you are unable to organize external meetings. https://technet.microsoft.com/en-us/library/jj204756%28v=ocs.15%29.aspx – Explains (firewall) ports. Even after a lot of reading, It’s hard to know where to start (in this blog post). There are soooooo many different things going on and a lot of stuff to remember. A good place to start could be certificate planning, which also means that you have to decide which IPs/hostnames you’ll be using in your own environment. Then again, I think the best place to start is planning network infrastructure/topology. First, consider whether you are going with a simple topology (Front-end, Edge server, Reverse proxy – we’re using this) OR a complex topology (multiple Front-ends, Edge servers, Reverse proxies). Second, It’s very important to have a working DMZ, and you should also know if you’ll be using (only) Public IP addresses or public IPs in combination with NATed ones. After you’ve got an answer to these questions it will be much easier planning for the other requirements. With this in mind, I’ll start off with the networking part. I’ll then move over to areas like DNS, certificates, actual Edge server installation, IIS ARR installation and finally some words about mobility and federation. Access Edge service. The Access Edge service provides a single, trusted connection point for both outbound and inbound Session Initiation Protocol (SIP) traffic. Web Conferencing Edge service. The Web Conferencing Edge service enables external users to join meetings that are hosted on your internal Lync Server 2013 deployment. A/V Edge service. The A/V Edge service makes audio, video, application sharing, and file transfer available to external users. Your users can add audio and video to meetings that include external participants, and they can communicate using audio and/or video directly with an external user in point-to-point sessions. The A/V Edge service also provides support for desktop sharing and file transfer. XMPP Proxy service. The XMPP Proxy service accepts and sends extensible messaging and presence protocol (XMPP) messages to and from configured XMPP Federated partners. Talked to your network guys about the network infrastructure (IPs/DMZ). Hardware (F5) load balancers can be a whole different story for example. Assign one IP for the internal network adapter and one for the external network adapter. Internal and External should be in different subnets. One interface is communicating with the internet and the other one is communicating with your internal network/AD. 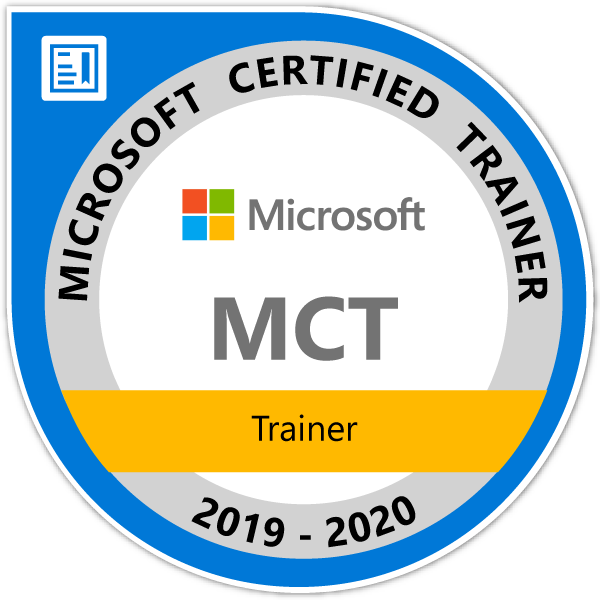 Have a look at https://technet.microsoft.com/en-us/library/gg429707%28v=ocs.15%29.aspx or https://technet.microsoft.com/en-us/library/jj204691%28v=ocs.15%29.aspx for examples. (I’m not going into much DNS details (yet), but you could name these new IPs lyncproxy-int.domain.com and lyncproxy-ext.domain.com for example). “Important: Similar to the Edge Servers, you set the default gateway on the external network adapter only. The default gateway will be the IP address of the router or external facing firewall that directs traffic to the Internet. For traffic that is destined from the reverse proxy to the internal facing network adaptor, you must use persistent static routes (such as the route command in Windows Server) for all subnets containing servers referenced by the web publishing rules. Setting a persistent route does not cause the computer to become a router. If IP forwarding is not enabled, the computer is acting only to direct specific traffic destined for another network to the appropriate interface. This is essentially setting two gateways – one as the default pointing to the external networks, and one for traffic destined to the internal interface and on to a router or other network. However, creating persistent routes for all subnets may not be necessary if your network’s routers are configured to summarize routes. Create a persistent route to the network where the router is defined and use the router as the default gateway. If you are not sure how your network is configured and need guidance on what persistent routes need to be created, consult with your company’s Network Engineers. The reverse proxy must be able to resolve the DNS host (A) records for the internal Director or Front End Server and next hop pool FQDNs used in the web publishing rules. As with the Edge Servers, for security reasons, we recommend that you do not configure a reverse proxy to use a DNS server located in the internal network. This means you either need DNS servers in the perimeter, or you need HOSTS file entries on the reverse proxy that resolves each of these FQDNs to the internal IP address of the servers”. This should be it for the networking part on the Reverse proxy server. Now we do the same on the Edge server. The network configuration on the Edge server follow the same pattern as the Reverse proxy. I’m using three external IPs and one internal IP. This is by best practice design (https://technet.microsoft.com/en-us/library/gg412847%28v=ocs.15%29.aspx). If you are in a limited-budget-external-IP-dilemma, you can also make it work with one external IP (not including that option in this text however). Now add the same routes as you did on the reverse proxy. There you have it, we can now move over to the DNS part. I assume that you by now have figured out your topology and configured networking on the involved servers. Good, that’s one step in the right direction. You might have noticed that I haven’t talked much about host names, only IP addresses. This is mostly because you can configure the networking part this far without knowing (almost) any host names. (Of course you most certainly will ask for a hostname at the same time you get an IP address, but anyways). No other records are required for our specific configuration/environment (at the moment). SRV records are a thing of the past and only needed when working with Lync 2010 clients. See http://blog.schertz.name/2012/12/lync-2013-client-autodiscover/ for more information. If you are going to use federation however (which we probably are in the future), you SHOULD set up SRV records (though not needed if manually entering servers). 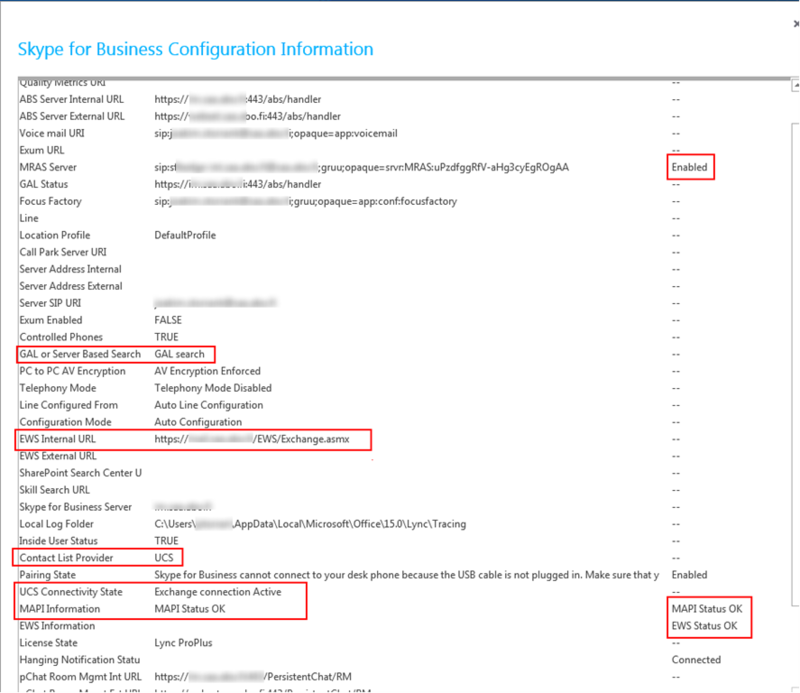 See: http://windowsitpro.com/skype-business/understanding-main-types-federation-skype-and-lync-environments. 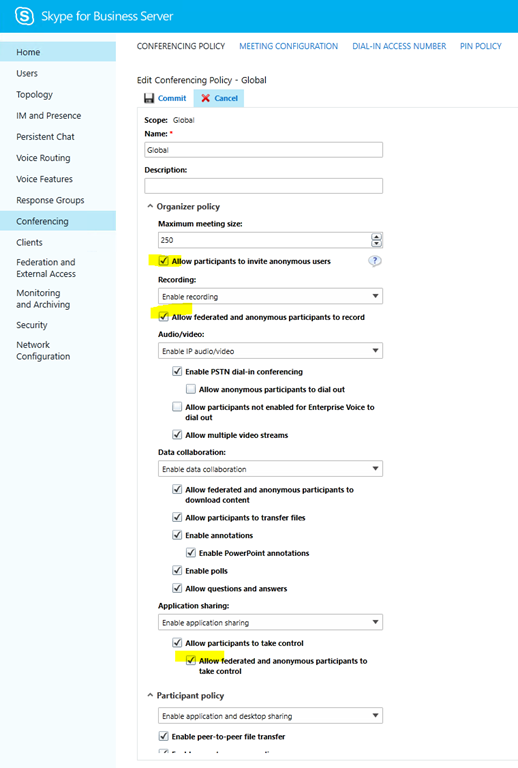 As you can see, Allowed Partner Server (Direct Federation) works without SRV records but specifying the records when you federate will probably still make your life easier. Read the above links CAREFULLY and you’ll have a MUCH better understanding, believe me 🙂Again, this setup works FOR US. 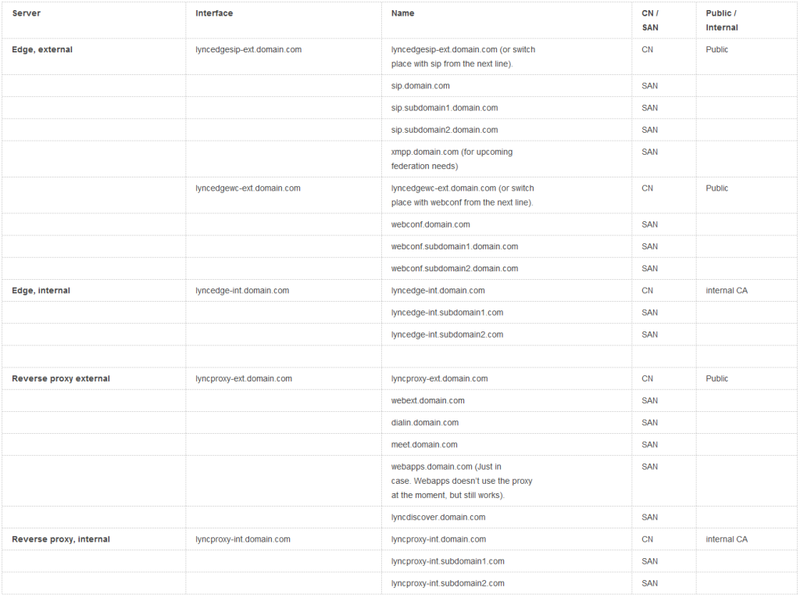 I’m not saying that the lyncdiscover.mydomain.com record should be removed from every internal DNS configuration out there. External DNS was much more straight forward. Comments are included in the picture. The DNS records are (as you can see) a bit different for the external network/outside world compared to the internal network. 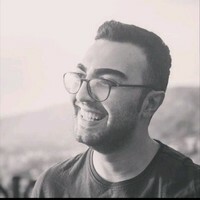 All external traffic goes through the reverse proxy, which in turn use URL rewrites to connect to the corresponding URLs on the inside network. (I’ll leave the URL rewrite / ISS/ARR discussion for a later chapter). You have probably noticed that the webext.mydomain.com record is present in BOTH the internal and external DNS. The reason for this is mobile devices. Mobile devices need to access the mobility service, and they do that ONLY from the outside. 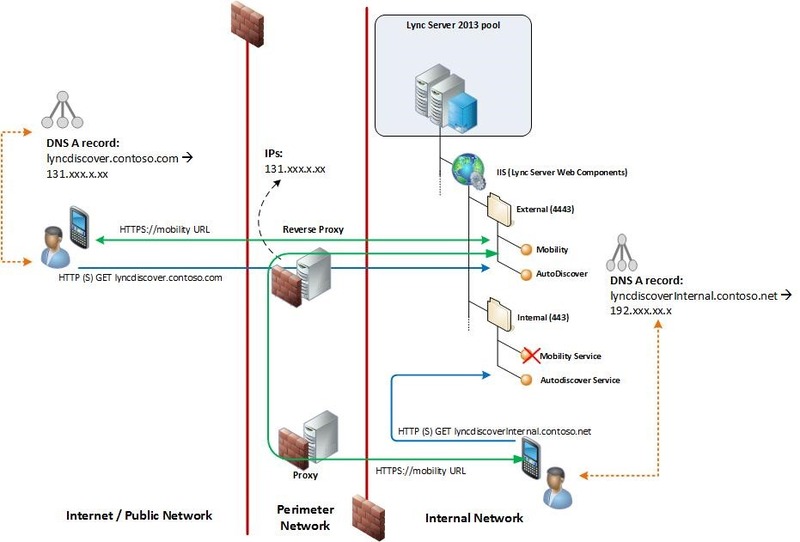 I’m yet again referring to the Mobility service flow using AutoDiscover (picture) at https://technet.microsoft.com/en-us/library/hh690030%28v=ocs.15%29.aspx. Lyncs own autodiscover feature will know if the client is on the internal or external network based on the lyncdiscover/lyncdiscoverinternal record. However, it’s a whole different story with webext.mydomain.com. If this URL is accessed from either the inside or outside network, the client is unable to know it’s final destination. This is because you’re pointing the client (in both cases) to the reverse proxy, which in turn point to the same URL internally and externally. This means that you’ll end up in an endless loop. To solve this you’ll edit the hosts-file. 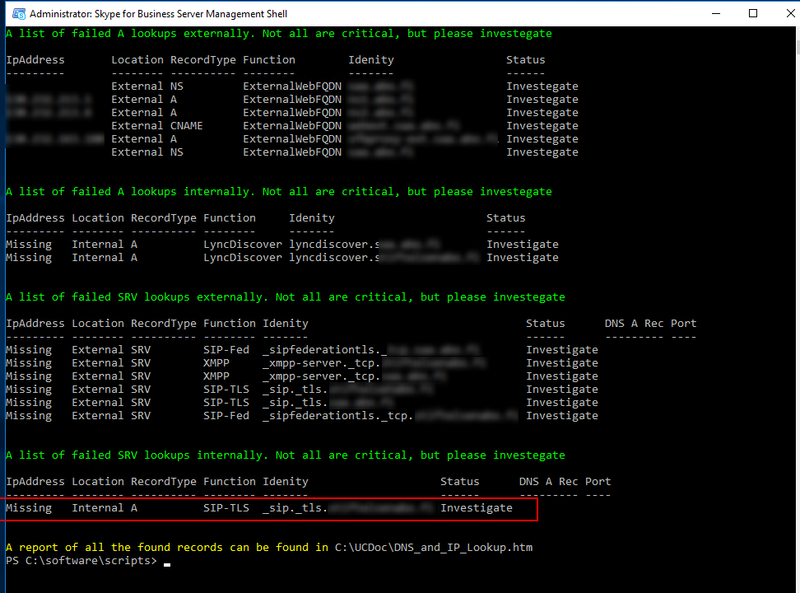 You also have to add a local DNS record for lyncdiscover, otherwise this record will remain unresolvable as it’s not present in the internal DNS. This was all a big mystery for me, as the documentation seldom mentioned this dilemma. I got an idea after hours of googling though – the holy hosts-file. Thanks to http://kressmark.blogspot.fi/2015/06/windows-2012-r2-iis-85-and-arr-30-as.html for the idea. This was by no means a big surprise, but you’ll get lost (in DNS) after hours and hours of testing. Believe me. 123.123.123.10 webext.mydomain.com, where 123.123.123.10 is the IP of your Front-end server. 123.123.123.10 lyncdiscover.mydomain.com, where 123.123.123.10 is the IP of your Front-end server. (Meet and dialin are already resolvable by internal DNS and correctly points to the Front-end). Take your time to read and plan – this way you’ll be rewarded in the end. The above links discuss both internal and external certificates. 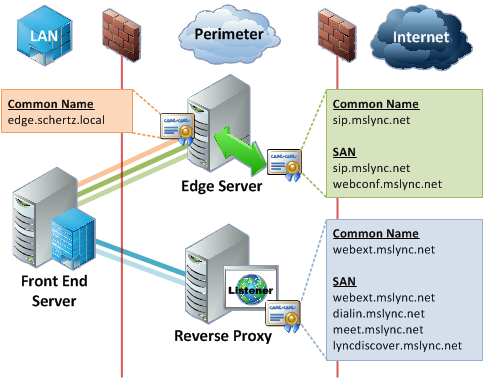 They also discuss the differences between the reverse proxy and the Lync Edge certificates. We’re not completely going by best practice regarding the certificates. We’re using external certificates on the internal front-end server. This is due to the fact that we already had an external certificate installed on the Front-end. It doesn’t do much harm either, and at least for us it’s not an extra expense. Without further stories I’ll present our “certificate solution”. We’re using one certificate per interface on the edge server, but you could also use just one certificate will all hosts included. This would be more expensive due to the fact that you’ll have to pay extra for additional SAN-names. (You DON’T need a certificate for the AV-interface on the Edge server). Fig 5. Edge and Reverse proxy certificate chart. To add to this list, our Front-end needed to get its public certificate renewed with the added host webext.domain.com. Before the renewal, it included public certs for lyncdiscover, lyncdiscoverinternal, meet, dialin and sip. Now it includes all those + webext. Webext is needed for the external Web Services (externally accessing the front-end). More about that later on. The following chapters has information about how to install the certificates on the servers. Congratulations If you’ve had the energy to read this far. It’s now finally time to install the Edge server 🙂 Much of the Edge installation/configuration is actually tied to the Front-end server however. You’ll start by making changes to your current topology and then export/publish the topology on the Edge server. Like you’ve probably noticed before, it’s the prep work that takes most of the time. (Internet is full of articles on how to install an Edge server). That said, I happen to like the post at http://www.sherweb.com/blog/installing-lync-2013-edge-server/ and our installation is based on this article. However, there are some differences. In Step 6, the article tells you to request internal and external certificates from the setup itself. We didn’t do it this way because our internal CA isn’t an “online certification authority” (it doesn’t respond to online web requests due to security reasons). Instead we made an offline request and signed it manually on the CA. A little bit more hassle, but worked just fine in the end. Add the certificates Snap-in. Select computer account –> local computer and click OK. Right click on the Personal –> Certificates folder. Imported certificate will show up in this location. Move the different certificates to their corresponding places (Personal, Trusted Root Certification Authorities, Intermediate Certification Authorities). See screenshots/figures below. Done. External certificates are also showing in this list as I have imported them in the same manner. Now, back to the installation post at http://www.sherweb.com/blog/installing-lync-2013-edge-server/. Software specifications were OK. Didn’t (need to) install Windows Identity Foundation on the Front-end. (It should be installed as a pre-requirement on the Edge server however). Fired up Topology Builder on the front-end and followed the guide. NOTE: This is a “DNS/certificate-thing”. Whatever certificate CN-record you created for the above services should be used. You can swap CN and SAN records for a more “clean” name, i.e. lyncedgeav-ext.domain.com vs. av.domain.com. (See above DNS/certificate chart and the note about switching places between CN and SAN). 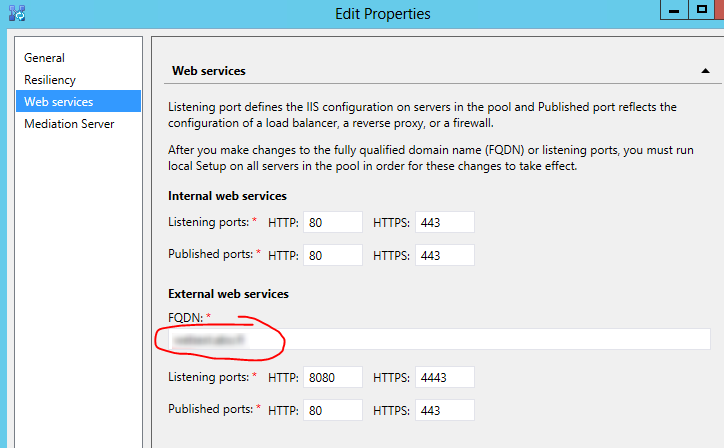 Changed the External web services in the Topology builder to match the one we have defined in DNS and in the certificate (would be webext.domain.com in the example). Exported the configuration (step 4 in guide). I decided to go with a combination of the Microsoft guide and the jackstromberg one this time. In the end, it worked perfectly. I had lots of problems and headaches down the line, but this time it had nothing to do with the guides (rather it had to do with typos and a non-working ARR that had to be reinstalled). Fig 10. 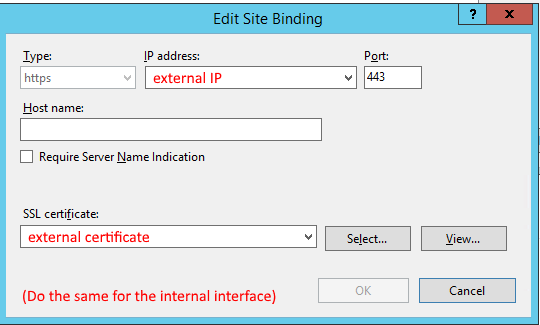 Adding https bindings in IIS. Fig 11. 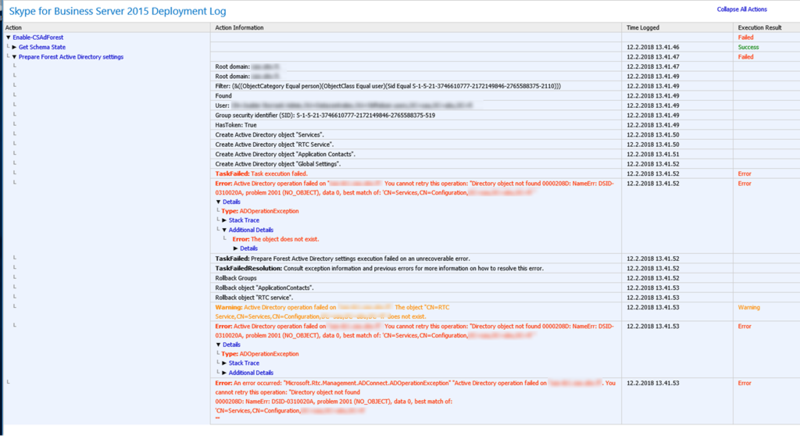 Adding https bindings in IIS. Remember to add both the internal and the external interface, with their own certificate. Now continue following the guides, or use another guide of your choice. A note from my own experiences: ARR is VERY STRICT regarding the URL rewrite rules. If something isn’t working, be sure to double check the rules! The mobility bit was a big headache, but in the end we got it working in a desirable way. The secret was to remove lyncdiscover.domain.com from the internal DNS (against many recommendations). See the DNS chapter for more information. Fig 13. Enable federation on the Front-end. In addition to this, it’s also recommended that you add a DNS SRV record (_sipfederationtls._tcp.domain.com). 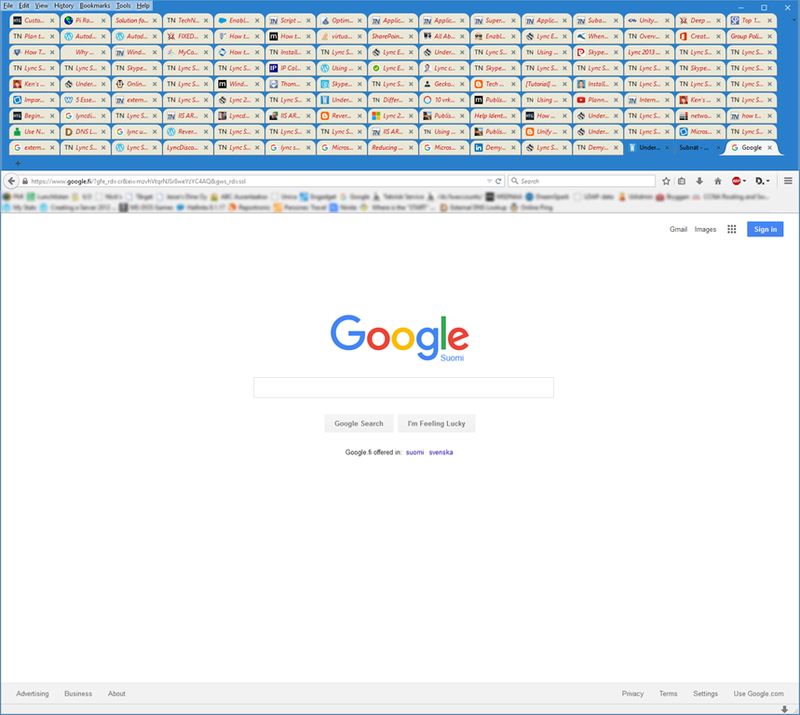 That’s Firefox with Tab Mix Plus and Multirow Bookmarks Toolbar Plus Extensions, btw.